Byron Rogers begins this charming and deftly written book about R S Thomas with a meditation on the question which ought to keep literary biographers awake at night: Why bother? Thomas himself put the matter succinctly in conversation with Rogers when he said that all we need to know about a writer’s life is in the work. The rest is gossip. Thomas is right. Even the most famous of all literary lives, Boswell’s Johnson, consists mostly of gossip, though Boswell raised his tittle-tattle to the level of art by giving it a context, a framework, a larger meaning. These are missing in most modern lives. There was a time when the biographer was expected to find an improving moral in his subject. Today we prefer our memorialists to dish the dirt, and to hell with uplift. The only moral now is that great men are just like the rest of us, but worse. While this approach is all very well for footballers and soap stars, how does it sit with the notion of art as a higher calling – a notion which most poets and their readers still entertain without thinking much about it? To what extent should we see poets as resembling priests, their creative functions distinct from their everyday lives, separating biography from criticism as Johnson’s Lives of the Poets do? And if we did, would the notion of literary biography as we know it survive? 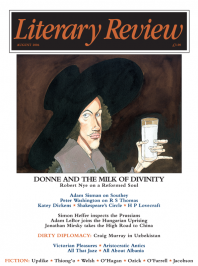 Alert to such problems, Byron Rogers takes a suitably cautious approach to his subject – all the more suitably, because Thomas proves to be a slippery customer, far from the plain-speaking persona he advertises in his mature poems. Rogers eschews the tombstone volume every writer is now deemed to deserve, in favour of something more like an extended memoir. He does not itemise everything known about Thomas, but travels lightly across the years. His tone is intimate, quiet and reflective. Rogers is frank but not intrusive. He isn’t out to psychoanalyse or deconstruct his subject. He doesn’t go through the underwear drawer. Though Thomas touches vital points in his biographer’s own history as a Welshman, Rogers seems to have no axe to grind, and his unspectacular manner allows him to probe the poet’s pretty strange life without sensationalism. He offers us a view of his subject in which the faults are not excused, condemned or explained, while the contradictions are indicated but not resolved. A telling portrait is achieved by narrating the story of Thomas’s life through a patchwork of quotations, letters, diaries, interviews and extended personal testimonies, most of them from what contemporary politicians call ‘ordinary people’. There are few literary critics or celebrities. Here we have gossip of a pleasing kind, small-scale but not petty, revealing but not prurient. One side effect of letting his sources speak for themselves is that Rogers has produced a very funny book. The contributors are not drowned out by their subject. Thomas’s most frequent response was said to be ‘H’m’ – so frequent that he used it as a title for one of his books: a revealing example of self-awareness. He was a witty man with the driest possible sense of humour, not averse to playing up his own quirks. This book shows that his friends and acquaintances have wits of their own. Outwardly Thomas went through the usual motions: education, career (in his case the Church), marriage, fatherhood, publication, holidays, pleasures – chief of which was bird-watching. His inner life was complex, unusual, fraught, its effects on his immediate circle hard to assess. Cultivating a phlegmatic manner, he was highly strung and often depressed, passionate about solitude but capable of enjoying company on occasion, addicted to routine but easily diverted from it when the mood took him. He read Kierkegaard but he liked eating chocolate, walking, cutting grass and making bread. Despite his sweet tooth, he was a dietary faddist who might eat nothing but Brazil nuts with vitamins for breakfast and drink eight pints of water each day. He cannot have been easy to live with, especially for his only child. Rogers pays scrupulous and touching attention to Thomas’s wife and son, by no means victims but not unscathed by their proximity to the poet. Elsi was an esteemed painter who went on working throughout her married life. It is impossible to say whether she sacrificed her own career to Ronald’s, though it can look that way. Gwyddion Thomas, blunt about his father’s failings (over which he has brooded at length), manages generosity. His final verdict is that Thomas, though full of love, was choked by inhibition. It is Gwyddion who remarks that his father was always putting on a show. Even taciturnity could be a kind of performance. He certainly looked the part, gloomily handsome with flowing locks. Gwyddion hints that the bleak honesty of the poems was not an affectation, exactly, but nor was it as straightforward as it seems. Rogers quotes in full Death of a Peasant, remarking its fine qualities. Reading it again in the light of this biography, you become aware of a tendency to staginess which colours much of Thomas’s early and middle-period work, not least his evocation of primal Welsh landscapes peopled by inarticulate rustics. Like Wordsworth, Thomas was a sophisticated middle-class outsider observing a life incomprehensible to him, valuable for that very reason. At their best, the grim humour of his georgics prevents them from lapsing into mere picturesque, but, not surprisingly, Thomas’s parishioners failed to see the joke. Blind to the comedy of their own lives as presented by the posh vicar, they didn’t take kindly to being described as yokels, even when they were being turned into art. Thomas’s role-playing may have owed something to a need for concealment. In the poems he attributes his feelings of loss and emptiness to the absence of God and the march of modernity, but the sense of his own hollowness pervades everything he wrote: it is part of what makes him so contemporary, despite his traditional subject-matter. Thomas doubted his ability to love himself or others, even his own wife and child. Such doubts can be hard to face, especially if you are so nervous that you suffer from shakes, black despair and near fits as Thomas did, turning for remedy to Valium and other sedative distractions. Among them we may perhaps include his nationalism. That may seem a perverse way to describe it, but Thomas’s patriotism feels more like a comfort blanket than a political programme. The idea of Wales was important to him; the reality was another matter. A priest by occupation – it is hard to tell whether his commitment went much further than that – and a poet by vocation, he was a patriot by choice. As Rogers presents it, his politics were shaped less by worries about self-government or cultural hegemony than by the longing for an ideal community located only in his own imagination. The results of such longing were often comic. He wrote mainly in English. His culture was English. Even his accent and demeanour conformed closely to English middle-class patterns – so much so that Thomas was an object of suspicion among those whose cause he thought he was espousing. He also discovered that Welshmen were easy to admire from a distance but hard to like close up. Being a bit of a snob, as everyone seems to agree, he flinched from the proletariat he describes in his poems, shocked by their materialism and depressed by what he perceived as their lack of interest in Welsh history and geography. Typically, he had little time for industrial Wales, which has left at least as deep a mark on the nation as its rural past, and it enraged him to see English incomers more involved than natives in preserving the heritage these Saxon barbarians were supposedly destroying with their caravans and holiday homes. Learning Welsh in adult life, for many years he found it hard to communicate in the language, being especially peeved if Welsh speakers confessed that they preferred to converse in English. For Thomas, everyone turned out to be unsatisfactory in the end. He was always an outsider. I have described his life as uneventful, and so it was, but if this memoir were a novel, the protagonist’s final act would appear as a comic moment of reversal which questions all our assumptions. Throughout the book one forms the impression that Thomas’s wife deferred to her husband in most things, not least in a taste for spartan catering and separate beds. But soon after Elsi died Thomas married another woman and at once adopted her very different style of life: centrally heated, tweed-jacketed, earthy, mundane. We have the sense that he began to enjoy his fame and the ever-increasing stream of royalties flowing from it which paid for very ordinary pleasures. Smiling on his new wife’s taste for gin and tobacco, he abandoned Elsi’s beloved damp cottage filled with her collection of tiny animal skeletons, in favour of the rented houses, hotels and holidays which so annoyed him when taken by incomers. The one habit he would not change was his morning ritual of reading and writing, despite Betty’s complaints about ‘bloody silences’. After all the gossip, this is what remains.